Two couples race to see how many balloons they can pop by biting them as the balloons are placed between them. 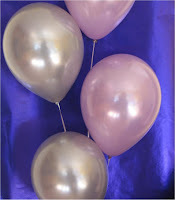 Have some balloons with shaving cream in them. Go fast and have each half of the room count out loud for their couple.